Virginia's Strength for the Journey retreat is hosted at the Bellfry, a family retreat home with a mission to build relationships with God, family and friends. Located in the beautiful Shenandoah Valley in Lexington, the Bellfry offers a hill for sunrise/sunset viewing, trails through the woods with meditation opportunities, a labyrinth to walk, and the feel of a warm country home. Inside, community gathers in the great room while a library, meditation room with beatitude stained glass windows, and upper bell tower are available for quiet and prayer. Secret spaces such as a Narnia closet and children's reading nook invite curiosity and adventure. Come enjoy the beauty of the Lord and the gift of community. Slideshow above - created by Dale Epperly; photos from couples retreat, Feb. 2015. God encouraged everyone through His Word, and blessed all with 18 inches of snow!! sung by Russ and Dawn Jones. Beautiful sunrise . 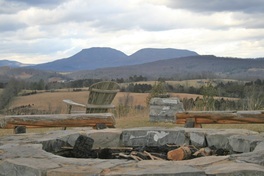 . .
Bell's Ridge - a place of silence to be with God or to view sunrises and sunset or roast marshmallows. One of many places to spend time with God in silence.